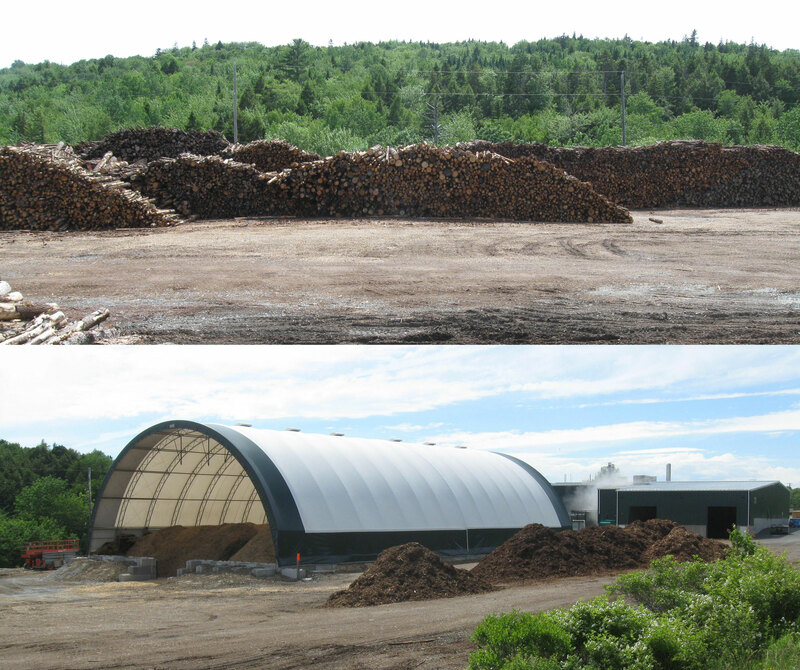 Stockpiles of GHG-generating primary forest biomass at the forest bioenergy plant in Lower Sackville, N.S. Photo courtesy of Mike Parker. CBC Halifax Information Morning has carried several interviews recently to do with the state of forestry in Nova Scotia, and in particular controversies surrounding cutting on the Western Crown lands by the WestFor consortium. Below is an abbreviated transcript of an 8-minute interview on June 27, 2017 with Colin Hughes, owner of G&C Hughes Enterprises Ltd. and Colin Hughes Forestry. Hughes contends that cutting on Western Crown lands by the WestFor consortium is creating a fibre glut which is severely impacting smaller private owners and operators. The next post (#2) will provide an abbreviated transcript of a follow-up interview on June 28 with Markus Zwicker, General Manager of WestFor Management Inc. Intro (Louise Renault): A man who owns a forestry company in New Ross is speaking out about a group of sawmills. The mills belong to the consortium WestFor. They are licensed by the province to cut Crown land in Southwest Nova. Colin Hughes says their practices are creating problems for the whole industry right across the province. He is the owner and President of G & C Hughes Enterprises Ltd. and Colin Hughes Forestry. CBC’s Don Connelly (DC): Tell me a bit about your businesses. Colin Hughes (CH): We are woods contractors, also work on some Christmas trees and we have repair shop do some construction for wood roads etc. DC: Tell us about the forestry component. CH: We have a couple of crews, harvesters, porters.. work mostly private now. We do a lot of selective cutting. We harvest the wood and we have our own trucking company which trucks the wood to various mills around the country…we have a lot of land holdings ourselves. DC: How has the ascent of WestFor affected your business? CH: It’s almost put us out of business, in fact a number of our friends and customers that come to our store don’t come anymore because they are just small private guys and they can’t sell their wood anymore because of the oversupply of Crown cutting. DC: Explain to us how this works. WestFor gets permission from the province to designate which areas of crown land will be harvested by contractors they hire? Is that about right? CH: yes.. and it’s not just WestFor. It’s the cutting of Crown lands throughout because the mills have a quota of Crown allocated directly to them them and WestFor is above and beyond, another supply, this is what’s affecting the private sector so greatly. The pulpwood market is the biggest problem at hand right now. There is a total glut of pulpwood. I have some numbers. The private woodland owners 2013-2016 produced 2.2 to 2.4 million cubic meters on average and they have been very consistent with that. The Crown during the same time has increased their production from 600 to a million cubic meters. The Western Region in that same timeframe went from 100,000 m3 to 300,000 in 2016. Huge increases. As if that wasn’t bad enough… back in 2013,14,15 we had more mills available; in the past year we have lost NS Power at Pt Tupper – they are buying 80% less wood; Scotia Biomass in Musquodoboit totally closed; Brooklyn Energy in Liverpool – they are not buying roundwood; Hefler Forest products in Sackville have closed; Great Norther Timber in Sheet Harbour – they used to buy a lot of roundwood for their chipping business and they are not buying a lot either. So if you take all those mills.. you are looking at 4-500,000 cubic meters less demand. The private woodlot owners pretty consistently produce their numbers. The big problem is that even as the market is tightening up, they are cutting more off of Crown than what the numbers show. DC: So the people that are part of WestFor, where are they selling roundwood? CH: They are trying to sell it to the mills same as the private sector. But right now there’s no place to sell it because its full. What’s upsetting: the private people can’t seem to sell a load of pulpwood but you can watch trucks going with fresh cut pulpwood right off the stump heading to the pulp mill but meanwhile the country is laying full of pulpwood they don’t seem to want to buy. That’s a little alarming. Not only that, WestFor has a stockpile of last year’s wood that is not even cleaned up yet and they are looking at cutting more… Through the election the Premier made a statement that there would be no more Crown leases go out until there was a total review… it was under two weeks from the time he made those public announcements, there were two, there was 2670 aces that went up on tender and probably 4 weeks after that there was another 3000 acres that went up on tender.. so you wonder whether anyone is listening to the Premier or not. Quite important, when you look at these lands, 2/3rd of the lands scheduled to be cut are clearcuts, which is concerning to some people out there. CH: We are just one small cog in the wheel, from one end of the province to the other this is a very upsetting situation, friends and neighbours and family and customers that support these local towns. Some do a little farming, grow some Christmas trees, cut a little wood, an important source of revenue to support families. This year has been the very first year that you could not sell your product if you cut it…more alarming, we are seeing that we can’t sell pulpwood of our own if we cut it yet the mills will send contractors in to cut your wood for you. We all know and recognize that these mills are very important.. if there is a time that the private sector is lagging a bit in supply, then by all means you need to go to that Crown land, that’s a good use of Crown land, to basically top off the need for these mills but by no means [should Crown lands ] oversupply them. This entry was posted in clearcuts, Private Woodlots, WestFor. Bookmark the permalink.